The Albrighton Hunt Team and Individual Show Jumping Triangular competition took place on Monday 18th February 2019 at Rodbaston College. Thank you to all the helpers who contributed to making this a very successful day for our branch. We had plenty of individual placings and winners in the various classes. Congratulations to Aniya and Emelia for individual placings first and second in Class 1 – to Issy, 5th and Katie 6th in Class 2B and Team 1st. 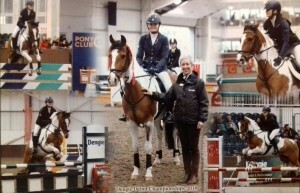 Class 3 indidividual and team placings for – Megan, Olivia, Kim, Charlotte, Isobel and Katie. 1st place to Sophie in Class 4 and 3rd place to Issy with Team 4th for Issy, Olivia, Charlotte and Molly and Team 2nd in Class 6 for Tom, Sophie, Lucy and Olivia. Pictured – Aniya and Emelia in Class 1. The Racing Rally video and stills are now posted to the website on the Racing page. The Equitation Cups Competition was a great success and our winners of each individual section will be awarded their cups at our presentation evening next month. Pictured are Emily and Charlotte Power, Olivia Gamble and Emelia Allen – well done to you all. Senior Camp photos and videos are now available on the Reports page. Many thanks to all our volunteers who helped contribute to the running of a highly successful event on Saturday. Despite the heat, we had some extremely good tests and a very well done to all the competitors who qualified for The Championships and The Regional Championships. 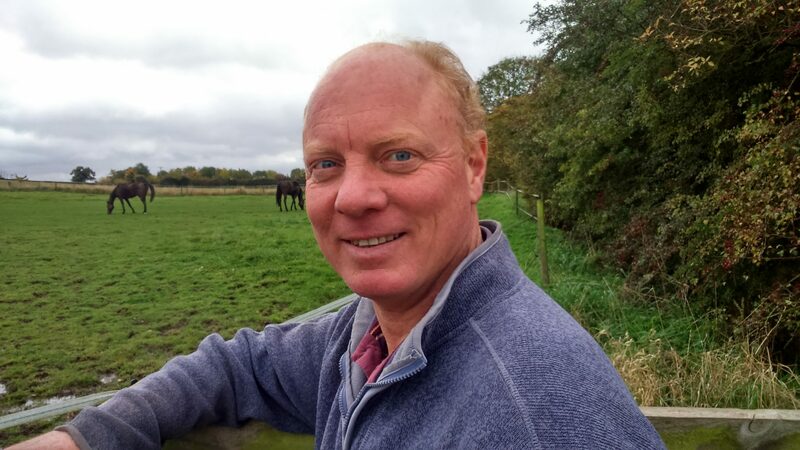 Thank you to the organisers, Kay Radford and Suzie Gosling; to our scorers Sue Clements and Steve Baxter and their teams and all the Dressage Stewards, Writers and Runners – many thanks Rory Howard. Well done to our Grassroots team who qualified for the Regional Championships and especially Megan Baxter who achieved the highest score for this event (pictured below with Olivia Busby). Congratulations must also go to Freddie Pitchford Edwards who was placed in his Open Section and so qualified for The Open Championships in August. 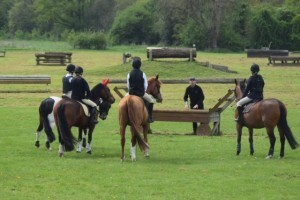 For those visiting this page for the first time, this branch offers a variety of rallies in most disciplines that The Pony Club has on offer. On the left hand side of this page there are the various discipline pages and our branch programme and rally page. Our rallies cater for children of all ages from 4 years upwards and unless specified for older members – rallies are for all abilities. 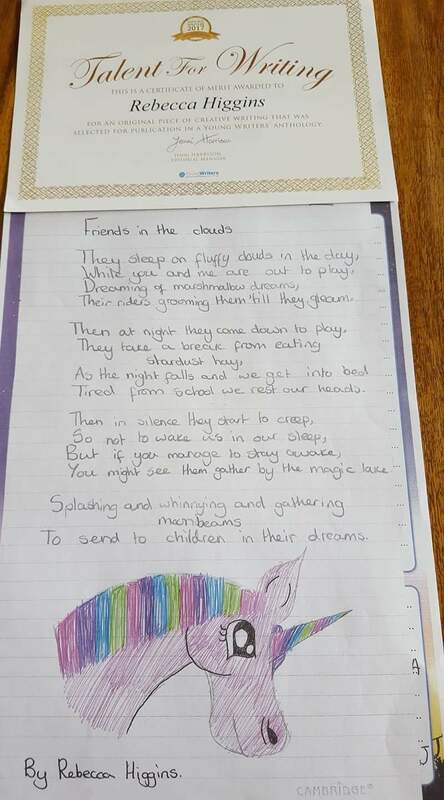 We aim to group children where possible in age and ability so that they can make friends with each other. Many congratulations to Lucy Thompson who was placed 5th in the Debut Competition on Sunday – 33 went through to the Jump Off and L:ucy held her nerve to have a double clear with Rio. A very enjoyable afternoon was had by all at the Area 7 Quiz kindly hosted by the North Staffs Pony Club. There were 10 exciting rounds of questions testing our equine knowledge from diseases to points of the horse, from equestrian venues to a practical round to identify unusual pieces of tack. Our members Tom, Megan, Issy and Rebecca formed the Albrighton Allstars team who finished a commendable 7th place. Well done! The parents’ team, Les Quizerables – including our helper Stacey – finished fourth out of the six supporters’ teams. A great improvement on last year’s unmentionable result! A big thank you to Sheryl Stewart for her help with our training for this event. If anyone would like to join us next year, you will be very welcome, you don’t have to be an expert and we can all certainly recommend it as a very entertaining event. Offers of help to Suzie Gosling would be greatly appreciated. We have a multitude of cups to award each year at this presentation evening and a new beautiful large silver goblet kindly donated by James and Jen Watson which is called the Accumulator Cup. This is for the all round member who has contributed the most throughout the year to this branch. In order to make the evening ‘go with a swing’ the Committee has drafted a points system which will be awarded to each member for the activities they participate in. This does mean that as the spreadsheet is emailed to you during the year you can check your member’s points tally and, if necessary, self declare any points that have been missed. For example, I will endeavour to tally the points for Hunting, for example, but as I am unable to make each meet, the parent will be responsible for self declaring by email to me within a week of this activity. There is no point being inundated with self declarations the week before the presentation evening as the trophies will already have been sorted to hand out. There will be age group categories which will be assessed by The Committee in the Autumn. Out with The Hunt yesterday were: Ella Terry, Tessa Weston, Paul Weston (Treasurer) and Olivia Busby. 2. Sunday 11th February 2018 – Area 7 National Quiz – Dawn has put a practise date on the rally programme and is sutiable again for all ages – we can enter a number of teams. 5. 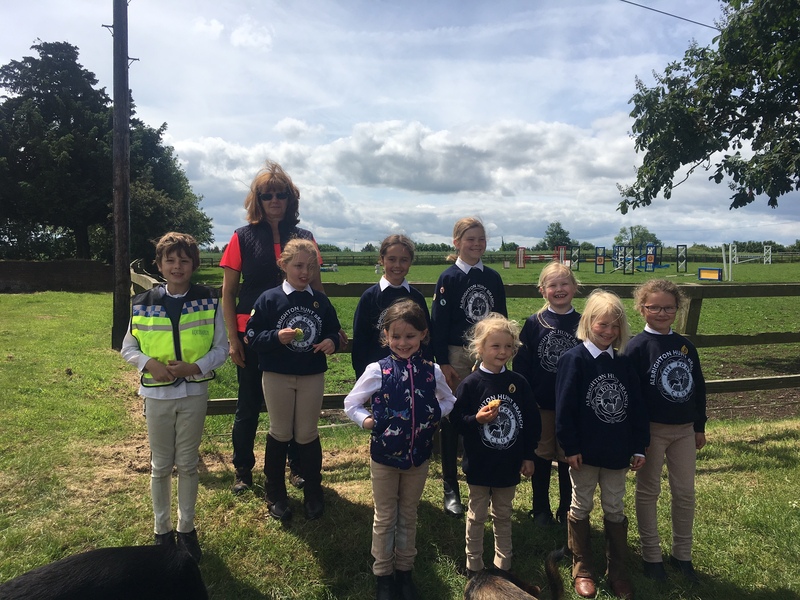 Thursday 5th April 2018 – Area 7 Horse and Pony Care – suitable for all ages. 6. Saturday 19th May 2018 – Area 7 Mounted Games – junior and senior team competitions – please speak to Louise Ellis if you are interested in training for this and other inter-branch competitions. 7. Saturday 7th July 2018 – Area 7 Dressage – organised by our branch (Wolverhampton Race Course) – please see Dressage page and Bonnie’s requirements. 8. Saturday and Sunday – 14th/15th July – Area 7 Tetrathlon at Ettington, Warwickshire – suitable for all ages from 4 years upwards. 9. Satruday 21st July – Area 7 Eventing, Offchurchbury, Warwickshire. 10. Wednesday 1st August – Area 7 Show Jumping, Solihull Equestrian Centre, Warwickshire. 11. Sunday 16th September – Area 7 Pony Racing, Wolverhampton Race Course. Good luck and enjoy your year. Videos and photos from Senior Camp are now ready here. Wow – what an evening! With over 100 family members and children attending and enjoying the Committee’s ‘bangers and mash’ supper followed by home made apple crumbles, the friendly atmosphere was aided along by music and an action packed film and photo compilation of rallies, senior and junior camp – thank you Steve Baxter. And a big thank you to Apley Farm Shop for supplying the sausages which were delicious. Citations were read out for nearly all our members summing up their achievements this year with the final five: – Jess Gough, Grace Turner, Harriet Watson, Alexander Howard and our Pony Club Member 2017 Sasha Hughes concluding the evening. Well done to all our members this year. Andrew Crane, Joint Master of the Albrighton and Woodland Hunt handed out all the cups after an extremely interesting talk on the history of the Albrighton and Woodland Hunt and when and where to join in. Please anybody who is interested in participating call or message Paul Weston (hunting page for contact details) as he is our point of contact for this season. He is regularly out with Tessa (one of our younger members) or you may see Isobel and Olivia Weston out on a Saturday morning. Senior Camp will again be held at Berriewood Farm and details of this will be posted next year on the Camp Page. Junior Camp – we have been mulling this over and propose to hold the two days at Watling Street Grange with camping in our garden (if you would like). The two days will be action packed with as many disciplines that we can timetable – mounted and dismounted and a bbq will be held at the end of the first evening with a camp fire and games for our members (ok ….. parents you can join in too if you want!!). I am not entirely sure about logistics for ponies at the moment but we will think more about it in the New Year. Thank you to everybody who attended and we look forward to seeing you during the Christmas Holidays at the rallies and the Christmas Show. What a lovely day! As one parent said, ‘this is what pony club is all about’ – a friendly atmosphere, happy children, bacon sandwiches with plenty of tea and coffee and biscuits and drinks galore for the children. Thank you to Suzie, Wendy and Louise who helped with the smooth running of the day and our teenage member, Charles, who used his mathematical GCSE skills and added up the score sheets! Class 1 B (and the winner of The Perpetual Equitation Trophy) 1st Holly Jones, 2nd Jazmine Rohan, 3rd Eliza Busby, 4th Jack Busby, 5th Hannah Jones and 6th Phoebe Glover. Class 2 B (and the winner of The Equitation Trophy) 1st Mia Terry, 2nd Ella Terry, 3rd Isobel Beasley, 4th Tessa Weston, 5th Lily Busby and 6th Esme Theobold. Class 3B (and the winner of The Brownie D Perpetual Trophy) 1st Sasha Hughes, 2nd Megan Baxter, 3rd Olivia Busby, 4th Asta Busby, 5th Teyha Swift Jones. Class 4B (and the winner of The Chairman’s Cup) 1st Harriet Watson, 2nd Jess Gough, 3rd Lexy Chambaud, 4th Isobel Weston, 5th Kim Jones. All trophies will be presented at our presentation evening on Friday 17th November at Blymhill Village Hall. There are five classes and each are defined by an age group and each winner in each class is presented with a trophy at the Presentation Evening. For those who attended last year, Jonquil Hemming recalled her years in the competition and her highlight being winning The Chairman’s Cup when she was 14 and 15 years old. The cup was presented to the branch in 1933 when it was established by Lady Brenda Hickman. The Pony Club as you all know was established in 1929 and its first Chairman was Colonel VDS Williams, who happened to be the husband of Lady Brenda Hickman, hence the cup was called The Chairman’s Cup. Their first rally was at The Kennels in Albrighton. A super morning to hold the Mini Road Rider Badge for our younger members. The rain stayed away and the sun shone as 10 members listened and signalled as they walked up and down the roads and junctions in our paddock on their ponies. Well done to you all and thank you to our instructor, Sheryl Stewart. 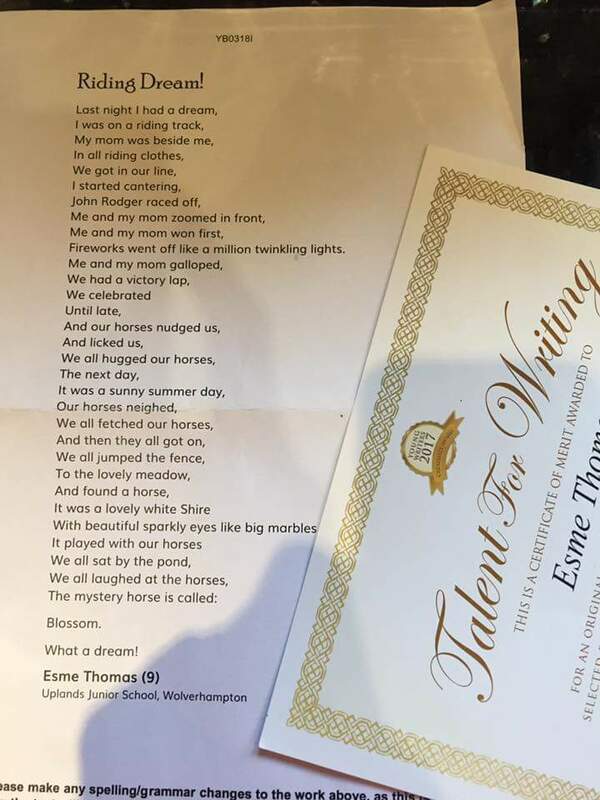 Our branch is full of hidden talents. I saw this on facebook last night and have been allowed to share it with you all. 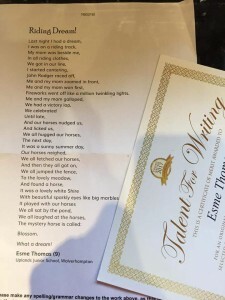 Well done Esme Thomas for her award for this poem at her school. 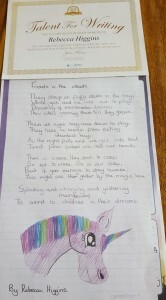 In addition, well done to Rebecca Higgins for her poem and super picture of her pony. They are both brilliant!! 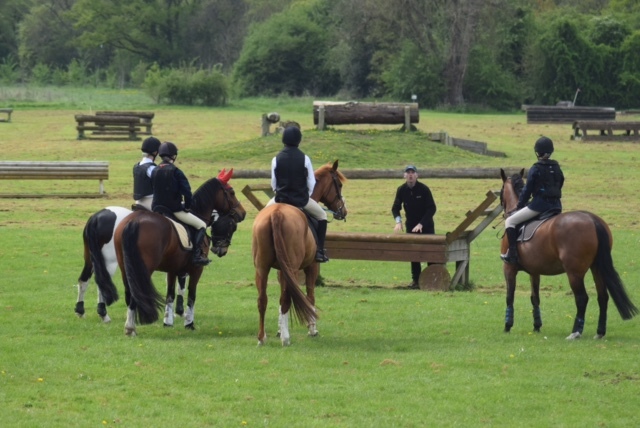 A very successful Cross Country Rally was held last Sunday at Lincomb Equestrian. Pictured is our Joint Chief Instructor Jon Rogers with some of our teenage members. Thank you Karl Hughes for the photo. The JUNE programme and rally form are now on their respective pages. I have left the May programme on as well just in case those who have not had time to fill out the form but want their child to attend a rally during the half term period – can do so if there is space on the rally. The four area qualifiers are approaching rapidly. Please can everyone who would like their child to be considered to represent this branch at this level – look at the respective discipline pages on the left hand side of this page. Take a pride in your appearance and your Pony Club Branch. When out competing at a local event, remember you are representing Albrighton Hunt. Politeness and Manners do not cost anything but go along way so please always remember to say ‘thank you’ to the Competition Organiser or Rally Committee Member and the Instructor. The Albrighton Hunt is a Branch or Area of The Pony Club.